There are generally two kinds of non-libelous headlines that, to me, are a failure of editing: those that convey an entirely incorrect (and often, dirty or offensive) meaning, and those that are just a nonsensical joining of words. Typos and goofiness like on Jay Leno’s “Headlines” segment, are not generally what I mean. Those often fall into the realm of silly human mistakes, except for when they land the headline into the first category. What I’m talking about are the times when the processes of editing and thinking break down. A milder example is the incorrect headline that might make someone laugh, but not in a good way. This headline makes me care not at all about Sen. Chris Dodd’s legislative endeavour and instead wonder when the Senate reverted to pre-Civil War violence. Bad headline, type No. 2: The second kind of headline was slightly more forgivable in the days of tight headline specifications, where words, and more importantly, characters, were at a premium. This still applies for e-mail newsletters and their subject headlines, but not so much for online news websites. You can use helping verbs, prepositions and whatever you need to make your point clear. Context, helping verbs and common sense would each have helped here. 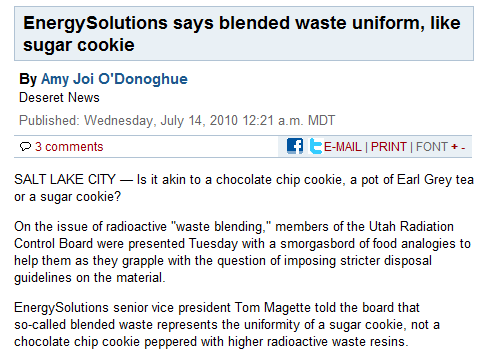 For one, the debate over nuclear-waste storage and blending in Utah did lead to numerous cookie analogies. But how would a reader who didn’t attend this thrilling meeting know that? Second, the word “is” after “waste” and the article “a” after “like” would prevent this headline from sounding like a Chinese fortune cookie parody. Third, journalists have the difficult task of being fully involved and informed on a story, then having to think about how newcomers to the information will think. It’s difficult to do both, but anyone knowing nothing about this story will not understand the headline — at worst, they may assume it’s somebody’s idea of a joke. The issue of nuclear waste, needless to say, is not a joke, particularly in Utah, where waste storage is second only to Nevada (Yucca Mountain) in the fervor of the debate. Mistakes happen, and all of us can have a bad day. But these examples are from real newsrooms, presumably with some staffing. We can do better, folks.